Looking for fresh apps for your iOS device? We’ve found 41 great apps that were released over the last couple of days. 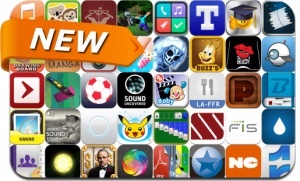 This new apps alert includes ·Solitaire·, Haunted Graves, The Godfather Slots, Solar 2, Super Dust Bunny, SketchBlock, Pokémon TV, Buzz's Movie Maker, Art Painting Board, Wallpapers For Minecraft, Snaptagram, Text Gram, Zuggol, KakaoAlbum, Thirst and many others. Free Music Download – Downloader and Player.